On Second Scoop: Ice Cream Reviews: Hershey's Ice Cream Chocolate Chip Cookie in a Cup! Hershey's Ice Cream Chocolate Chip Cookie in a Cup! While I was busy grabbing my first pint of Hershey's ice cream, I couldn't help but grab one of their interestingly packed ice cream sandwiches. 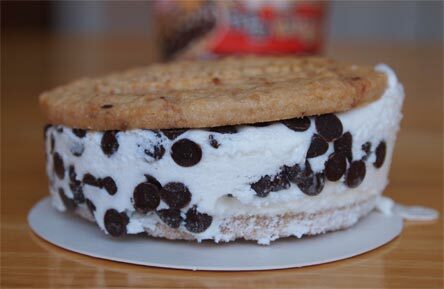 I mean, I LOVE ice cream sandwiches... and I was hungry... and I really love ice cream sandwiches. Ok, let's see what $2.29 buys me. 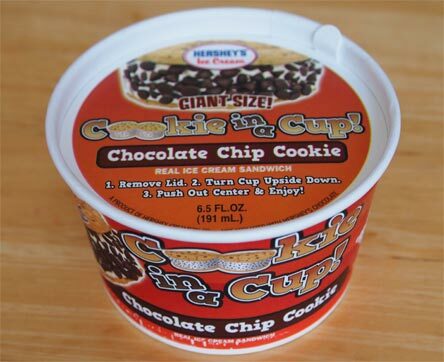 Hershey's Ice Cream Cookie in a Cup! Doh, it's a bit lopsided which may have been a shipping/delivery issue... but it's missing chips that don't seem to be anywhere. Hmmmm. Any half decent sandwich will have the problem of me trying not to inhale it.... this one has that problem. You know, sometimes I get a bit of saltiness from the cookie. I'm not a huge fan of that. The flavor balance seems fine, kind of 50/50, but I think it's because neither side is particularly strong. Neither side is trying to steal the show. The cookies seem a bit floury, they could be a bit sweeter and a little more flavorful. They aren't terrible, they're just not exquisite. Then we have the ice cream that is kind of weird. There's not a ton of flavor and the texture is kind of... I don't know how to describe it, crunchy is the only word popping in to my mind. I'm thinking this one was let to melt at some point and then refrozen. Oh the tribulations of a gas station purchase. And now it's gone... and I am sad... cause I'm still hungry... cause I'm me and have no self control around ice cream sandwiches. This is why I only buy one at a time.